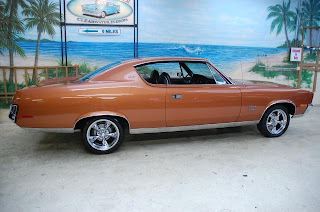 1970 AMC Rebel SST - AMC was the smallest of the US auto manufacturers. The build quality of their cars wasn't great and their technology was old even when it was new. Looking back though, they made some interesting cars and this is one of them. This is just a cool old American car. It was AMC's answer to the Chevy Impala 2 door and cars of that ilk... A big car with a big engine and a few "sporty" touches. It's in the tiny details where this car stands out. Look at the lines of this car, the curve of the roof and c-pillar. Look at the chrome strip on the trunk that bends down to meet the bumper. Look at the flush door handles. Look at the shape of the dash with the heater controls on the left and the radio, with its knobs on top, on the right. It's perfect symmetry. This car was different from anything the Big 3 offered. So many cool old AMC cars wound up in junkyards. It's rare to see one today, especially one restored to this condition. Whether you like old AMC cars or not, it's really fun to look at. 1991 Peugeot SW8 Turbo - As I've written in the past, the French had no real clue about how to sell cars in the US. If they had, Peugeot would still be selling cars here and the roads would still be populated by old 505s. In my opinion, the 505 was the best car Peugeot ever offered in the US. A friend once called the Peugeot 505 a "French Volvo". That's a pretty good description. Like a Volvo, they're roomy, comfortable, dependable (yes, really) and, depending on the engine you choose, entertaining to drive. (The 2155cc turbo engine in the car gave it a 0-60 time of around 8 seconds. Pretty impressive for a big, boxy station wagon.) Unlike an old Volvo, they're stylish and have the ride / handling combination that the French do so well. I don't know the numbers, but I don't think many Peugeots came to this country painted red. That's too bad. This car looks really good in red. It's almost sporty, or at least as sporty as a station wagon can look. I've owned a few 505s. I liked each one. I've been looking around for a "beater" lately. This car is too nice to be a beater, or I'd be all over it. Located in Syosset, NY, click here to see the eBay listing. 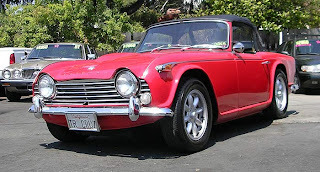 1967 Triumph TR4A - A couple of weeks ago I wrote one post about 3 Triumphs; a TR3, TR6 and TR7. I didn't do a TR4. I'm making up for that now. It could be argued that the TR4 was Triumph's first "modern" sports car. A lot of its parts were carry-overs from the TR3, but it had roll up windows, a full synchromesh transmission, dash vents and a few other things not seen on the TR3. The Michelotti styled body was a masterpiece. The TR3 was a perfectly styled British roadster, but the TR4 was classier, more upmarket looking. This is a TR4A. It has an independent rear suspension that gives it better handling characteristics than the earlier TR4s had. It has been restored and looks great. The price is towards the top end of the scale, but it appears to be a car you could drive right away and not worry about expensive repairs for quite some time. Located in Santa Cruz, CA, click here to see the Craigslist ad. The most luxurious Mini ever made - and already a firm favorite, the Mayfair is a little jewel of a car. Still a totally practical and economical Mini, but with a special chic all of its own. Stylish coachlines and 'Mayfair' motifs provide tasteful exterior identification. Inside, the Mayfair is lavishly trimmed with plush Rochelle fabric, on seats, door trims and side casings. Front seats recline, and have adjustable head restraints. Equipment levels compliment the attractive upholstery, with a push button LW/MW radio, four spoke steering wheel, twin door mirrors, twin door bins, tinted glass, face level air vents, opening rear quarter windows and cut-pile carpet. Instrumentation is neatly displayed in a binnacle in front of the driver, and includes a temperature gauge. Other Mayfair refinements include a molded handbrake grip, a locking fuel filler cap, and styled road-wheel covers. This one has been converted to LHD. It was used as a daily driver. The car is not perfect. 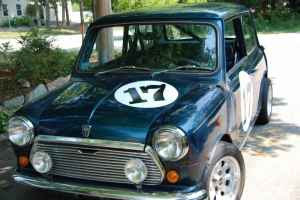 It has some rust issues, as you would expect on Mini that was driven in New England winters. The asking price is $5000.00. That's a lot of money to pay for a rusty car, but then again, it's not a lot of money to pay for a high-end gray market Mini. The seller says he is "flexible on the price". If you can talk the seller down a bit and you're handy with a MIG, this could be a nice car for you. Located in Cohasset, MA, click here to see the Craigslist listing.